Winter is coming, and fall is the perfect time to prepare your car for the frosty, chilly Colorado weather. As the temperatures drop, your car needs some preventative maintenance to ensure it runs smoothly throughout the winter season. The last thing you want is to be stuck with will be a broken down vehicle in the middle of a snow storm. Here are a few things to check for before the winter arrives. Be an expert in Colorado chain law. It’s important that your engine’s coolant system is in balance or you run the risk of the engine overheating when the temperature drops below freezing. For winter, there’s typically more coolant than water, so the ratio needs to be adjusted. Coolant also protects your engine from rusting. In the autumn, get the old coolant flushed, check for any leaks and refill it with fresh, new coolant that contains ethylene glycol. Slippery ice and unpredictable road conditions make winter driving especially hazardous if your tires are not well-maintained. It’s a good idea to inspect each tire’s tread; if it’s worn out replace the tire. 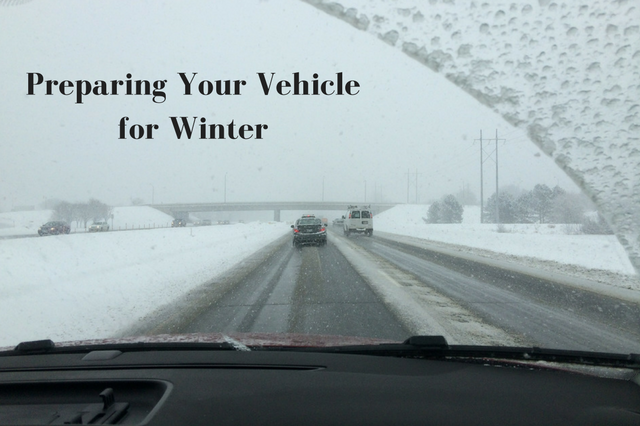 Some people use all-season tires, while others change tires specifically for winter driving. Whatever your preference, ensure you change all four tires to winter (not just two) as the differing tires can wreak havoc on your car’s traction and overall system. While it’s normal for tire pressure to change throughout the day (cool air settles to the bottom of the tires during the night and makes it look “flat”), you’ll notice an even bigger difference in the winter. Check your owner’s manual for the ideal tire pressure for your car. You’ll get poorer mileage and more wear-and-tear with under-inflated tires, so remember to check the pressure regularly. The colder temperatures in winter require your engine to use a thinner oil such as 5W-30, especially if temperatures drop below the freezing point. Using the proper winter-grade oil helps to regulate your engine’s temperature. Keeping your car warm in the winter is essential for safety and comfort. You’ll want to confirm that the window defroster is working properly, along with the blowers. Check your radiator for signs of corrosion or leaking. One of the most common reasons vehicles get stranded in winter is due to a dead battery. A fully-charged battery can withstand colder temperatures before acting up, while a battery that’s running low on juice will tend to freeze even in mild temperatures. And of course, it is a great idea to pack an emergency kit in case you ever get stranded. Make sure it contains blankets, flares, flashlight and batteries, a shovel and other necessities. With the right preparation, your vehicle will stand a better chance of surviving the winter months without a breakdown. Do you want to practice your driving or brush up on your skills before the winter comes? Check out WSDI’s Precision Skills Track where you can drive on a closed loop track with various obstacles. Practice your braking, maneuvering, and skid control skills and learn everything about Colorado chain law passenger vehicles.